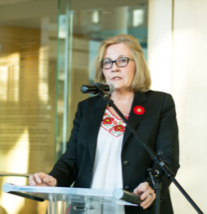 With more than thirty years experience as a senior executive manager and award-winning journalist, Marie Wilson brings ample experience in education, human rights and awareness with her work across Canada and internationally. Wilson has taught at universities, high schools in Africa, and was responsible for implementing and executing training programs through the South African Broadcasting Corporation as part of South Africa’s Truth and Reconciliation Commission. She was the first television host of Focus North, a weekly information program for northern Canada, and developed the first Daily Television News special for northern Canada while simultaneously advocating for the employment of Indigenous staff and on-air representation of Indigenous peoples. Wilson has also previous served in both federal and territorial Crown Corporations as senior executive manager, as well as an independent journalist contractor and consultant.